Who’s excited about next year’s elections. Yeah me neither. The big question is will the Republicans continue to hold both Houses of Congress? With the Republicans less than stellar (to put it mildly) achievements so far, who knows? It’s really hard to generate much excitement from the base with all the broken promises. However, from my perspective, I’m not really seeing all that much sustained excitement coming from the Democratic base either, especially when they’re entire platform is based on attacking Donald Trump. 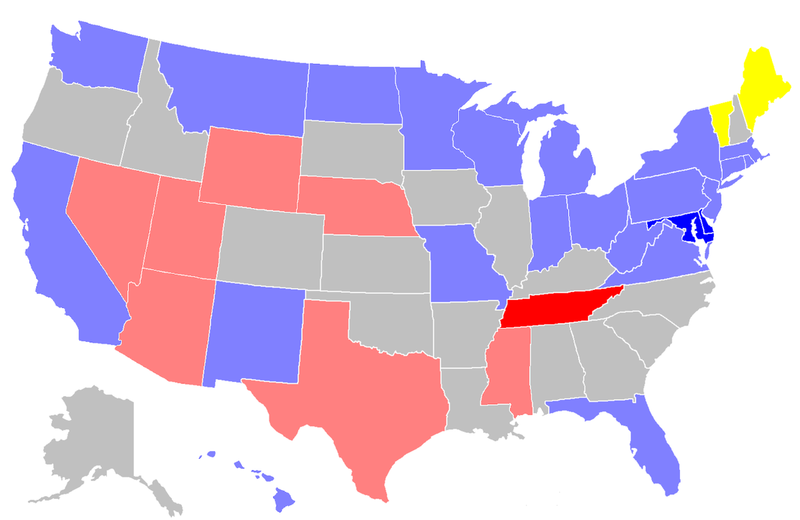 Theoretically the Senate should be fairly easy for the Republicans to hold or gain seats. Of the 33 seats up for election Republicans only have to defend eight seats, the remaining 25 are currently held by 23 Democrats and 2 Independents that caucus with the Democrats. Notable among those 23 Democratic and seats 10 are in states that were won by Donald Trump, some by double digits, in last year’s Presidential elections. One of those seats is currently held by Joe Donnelly in my home state of Indiana which Donald Trump took by 19%. While it’s calmed down now, as early as March we started being inundated with ads for next years Senate race. While no serious candidate has declared their intention to run my problem is that the two that most mentioned as competing for the Republican nomination, Luke Messer and Todd Rokita are current House members that have poor Conservative voting records. I should also point out that next to West Virginia’s Joe Manchin, Joe Donnelly is one of the Democrats most conservative members, especially when it comes to voting for life. Another state in similar circumstances is Missouri, currently held by Democrat Claire McCaskill, a state that Donald Trump won by 18%. Senator McCaskill received some attention earlier this year for calling out now AG Jeff Sessions for his meetings, as a Senator, with the Russian ambassador only to be quickly rebuked when it was revealed that she too had similar meetings in the past with the Russian ambassador. Along those lines it was with some interest when I came across the recent headline: “Top Missouri Republican Breaks Hearts, Won’t Challenge McCaskill” in Townhall.com stating that Ann Wagner will forego a chance to run for the U.S. Senate and instead concentrate on running for re-election for her seat in the Missouri state House of Representatives. The line in the article: “Wagner had the support of Senate Majority Leader Mitch McConnell and the National Republican Senatorial Committee,” made me thankful that she chose not to run as I don’t feel we need another reliable GOP establishment follower in DC. It was shortly after Rep. Wagner’s announcement that she would not seek the Senate seat that I was encouraged for Missouri when I was hearing Austin Petersen on the interview circuit making his case for a Senate run on the Republican ticket. Most will likely recall Austin Petersen’s run for the Presidency in 2016 for nomination on the Libertarian ticket. I, along with many others, felt that the Libertarian party blew a big chance for having a louder voice on the national stage, considering that both major party candidates were extremely unpopular, by nominating Gary Johnson to represent the party on the ballot, especially since his biggest campaign issues were legalizing marijuana plus comparing himself to Democrat/Socialist Bernie Sanders. As I’ve said elsewhere, my vision for America is one where gay married couples can defend their marijuana fields with fully automatic machine guns. Technological and social changes notwithstanding, this is ultimately the kind of world that the Founding Fathers envisioned — where all lives matter from conception to death, and where all people are given the opportunity to make the most of their inherent liberties as rational human beings. If I am elected, I will strive to put Washington in its rightful place — as the protector of our most basic liberties, not our political policeman — and put the people in their rightful place — as the true governors and shapers of their lives and destiny.